WASHINGTON, DC, January 7, 2014 (ENS) – The American Bird Conservancy warns that the cold snap gripping much of the nation can be deadly to birds; some are being driven farther south than normal in search of open water and food sources. Putting out extra food on bird feeders and on the ground, including suet and fruit for birds that don’t eat seeds, can make the difference between life and death for some birds. Lebbin said that an ice-free water supply is also critical and often attracts birds that never visit feeders. “Water is just as important as food, if not more so. By providing warm water frequently, or installing a bird-bath heater, people can help the birds out substantially during severe weather events,” he advised. Weather events such as this cold snap gripping the Midwest, and the southern and eastern states are not expected to significantly affect wild bird populations, said Lebbin, but people worry about them. “People care about birds and other wildlife in this country. We get calls all the time from people wanting to know what they can do to protect our wildlife. Right now, there is a greater sense of urgency,” he said. Waterfowl are affected when the water bodies on which they depend freeze over. In response, ducks, geese, swans, and mergansers escape by traveling further south to find ice-free water. 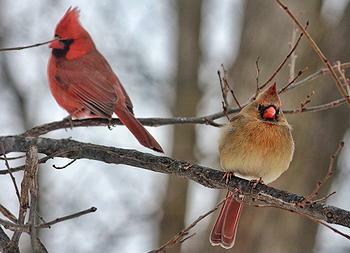 Ground-feeding birds such as cardinals and sparrows are affected when snow cover stays in place, reducing available food. Prairie-chickens will dive into deep snow where they can keep much warmer by avoiding colder surface temperatures and wind chill. Tiny kinglets will huddle together at night to keep warm, conserving heat by crowding together. “The impacts of the intense cold are complex, but there is no question that there will be mortality for birds and other wildlife. It is a part of nature. How much mortality will be a function of the intensity of the freeze, how long it lasts, and the birds’ condition. Providing food and water might help some birds better survive this deep chill,” Lebbin said. He suggests that homeowners plant native trees and shrubs that will bear fruit or seeds in the winter to give food and shelter to wild birds. WASHINGTON, DC, January 3, 2014 (ENS) – The U.S. Environmental Protection Agency is proposing standards for the amount of air pollution that can be emitted by new woodstoves and heaters, beginning in 2015. The agency estimates the proposal would make the next generation of stoves and heaters an estimated 80 percent cleaner than today’s most modern stoves and heaters. The proposal would affect a variety of wood heaters manufactured beginning in 2015 and will not affect heaters and stoves already in use in homes or currently for sale. Smoke from residential wood heaters, used around the clock in some communities, can increase toxic air pollution, volatile organic compounds, carbon monoxide and soot, also known as particle pollution, to levels that pose serious health concerns. Particle pollution is linked to serious health effects, including heart attacks, strokes and asthma attacks. In some areas, residential wood smoke makes up what the EPA calls “a significant portion of the fine particle pollution problem.” The agency proposes to work in concert with state and local programs to improve air quality in these communities. In October 2013, a coalition of seven states led by New York filed a lawsuit against the EPA for violating the Clean Air Act by failing to adequately limit air pollution emissions from new residential wood heaters. The coalition contends the EPA’s existing emissions limits, which have not been revised in 25 years, are outdated and leave out popular types of residential wood heaters, including outdoor wood boilers, which have proliferated in many areas of New York. The EPA proposal covers several types of new wood-fired heaters, including: woodstoves; fireplace inserts; indoor and outdoor wood boilers, also called hydronic heaters; forced air furnaces and masonry heaters. Many residential wood heaters already meet the first set of proposed standards, which would be phased in over five years to allow manufacturers time to adapt emission control technologies to their model lines. The proposal does not cover fireplaces, fire pits, pizza ovens, barbecues and chimineas. When the new standards are fully implemented, EPA estimates that for every dollar spent to comply with these standards, the American public will see between $118 and $267 in health benefits. Consumers also will see a monetary benefit from efficiency improvements in the new woodstoves, which would use less wood to heat homes. The total health and economic benefits of the proposed standards are estimated to be at $1.8 to $2.4 billion annually. EPA will take comment on the proposal for 90 days after it is published in the Federal Register. The agency will hold a public hearing February 26, 2014 in Boston. The agency expects to issue a final rule in 2015. WASHINGTON, DC, January 7, 2014 (ENS) – Congress has allowed 14 renewable energy tax credits to expire as of midnight on December 31, 2013. They include extension of tax credit for energy-efficient existing homes or new homes, for energy-efficient appliances or for energy-efficient commercial buildings. Tax credits for alternative fuel vehicle refueling property and for two-wheeled or three-wheeled plug-in electric vehicles have now expired. Also now expired are the extension of second generation biofuel producer credit, extension of incentives for biodiesel and renewable diesel and other renewable resources, and extension of production credit for Indian coal facilities placed in service before 2009. The federal government will no longer extend the special rule for sales or dispositions to implement Federal Energy Regulatory Commission or State electric restructuring policies for qualified electric utilities. The solar and wind tax credits were not renewed but they extend through 2016. The 30 percent tax credit to small wind energy systems and geothermal heat pumps will be available to December 31, 2016. The Solar Investment Tax Credit is a 30 percent tax credit for solar systems on residential and commercial properties. The multiple-year extension of the residential and commercial solar ITC has helped annual solar installation grow by over 1,600 percent since the ITC was implemented in 2006 – a compound annual growth rate of 76 percent, according to the Solar Energy Industry Association. The existence of the ITC through 2016 provides market certainty for companies to develop long-term investments that drive competition and technological innovation, which in turn, lowers costs for consumers, says SEIA. The wind industry faces uncertainty again as the wind production tax credit expired at midnight December 31, 2013. The tax credit is still available to wind power developers that started “physical work of a significant nature” by December 31. Wind developers could either meet certain construction milestones or spend at least five percent of the total project cost by the deadline. Qualifying wind farms must be generating electricity by 2016. The incentive gives wind producers a 2.3-cent federal tax credit for each kilowatt-hour generated and can be used for up to 10 years. The American Wind Energy Association said the credit was responsible for $25 billion in private investment in 2012 and supported more than 80,000 jobs across the country. The wind tax credit is expected to cost $7.7 billion from 2013 to 2017, according to February estimates by Congress’ Joint Committee on Taxation. A different estimate from the Congressional Research Service put the cost of the credit at $9.7 billion from 2013 to 2017. WASHINGTON, DC, January 7, 2014 (ENS) – The U.S. Department of Agriculture is calling for public comments on the deregulation of transgenic corn and soybeans genetically engineered to be tolerant to the herbicide 2,4-D.
On Friday, USDA’s Animal and Plant Health Inspection Service, or APHIS, released for public input its Draft Environmental Impact Statement on the two crops. Dow AgroSciences’ genetically engineered corn and soybean plants are the first developed to be resistant to 2,4-D and are intended to provide farmers with new plants to help address the problem of weeds that have developed resistance to other herbicides, according to APHIS. Dow AgroSciences calls the engineered varieties Enlist™ corn, Enlist soybean and Enlist E3™ soybean. APHIS is performing an assessment of these genetically engineered plants, while the U.S. EPA is conducting a concurrent review of the related herbicides. The Draft Environmental Impact Statement will be available for public review and comment for 45 days from publication in the Federal Register on January 10. Agent Orange, the herbicide widely used to defoliate forests and croplands during the Vietnam War, contained 2,4-D. But, according to the National Pesticide Information Center at Oregon State University, the controversy regarding health effects of Agent Orange centered around the 2,4,5-T componentof the herbicide and its contaminant, dioxin. The herbicide 2,4-D has been used in the United States since the 1940s, and it was evaluated for re-registration in 2005 by the U.S. Environmental Protection Agency. The EPA determined that 2,4-D was eligible for re-registration, but required certain changes to labeled uses to mitigate risk. Nichelle Harriott, scientist at the national environmental group Beyond Pesticides, is opposed to the deregulation for many reasons. “The engineered varieties will not only spawn new weed resistant strains, but contaminate the environment and increase the public health risks to cancer and Parkinson’s disease, especially in farmworkers and farming communities exposed to 2,4-D,” she said. If the deregulation is approved it will increase 2,4-D use, with associated health and environmental hazards, says Harriott. Scientists around the world have reported increased cancer risks in association with its use, especially for non-Hodgkins Lymphoma. It is also neurotoxic, genotoxic, and an endocrine disruptor. Studies have also reported that occupational exposure to 2,4-D is associated with an increased risk of Parkinson’s disease, Harriott warns. The proposed deregulation is running into criticism from farmers, environmentalists and other concerned groups. One issue is 2,4-D drift to off-site locations, affecting endangered species and non-target crops. As they did before USDA decisions to deregulate other genetically engineered soybeans, alfalfa, and sugar beets, safety advocates charge that the agency fails to take into account environmental concerns, such as the indiscriminate nature of GE gene flow among crops, a heavy reliance on faulty data, and a high degree of uncertainty in making safety determinations. The EPA is expected to publish a notice that the DEIS is available for public review in the Federal Register on January 10. A copy of the DEIS provided to EPA can be reviewed at: http://www.regulations.gov/#!docketDetail;D=APHIS-2013-0042. CHICAGO, Illinois, January 7, 2014 (ENS) – In a report issued Monday, the U.S. Army Corps of Engineers has identified physical separation of the Mississippi River and Great Lakes watersheds as the most effective way to prevent invasive species such as Asian carp from moving between the two waters. Ordered by Congress in 2007, the Great Lakes-Mississippi River Interbasin Study, GLMRIS, comes two years after an independent analysis by the Great Lakes Commission and Great Lakes and St. Lawrence Cities Initiative found separating the two water bodies was feasible and affordable. The study outlines eight ways to prevent the transfer of invasive organisms through Chicago-area canals built more than 100 years ago to connect the two water systems. Conservation groups today responded to the report by agreeing with the Corps that only one of the eight alternatives, physical separation, is effective at stopping the movement of invasive species. “The U.S. Army Corps of Engineers study leaves no doubt that the most effective way to stop invasive species from wreaking environmental and economic harm on the Great Lakes and Mississippi River communities is through the construction of a physical barrier,” said Joel Brammeier, president and CEO of the Alliance for the Great Lakes. “This paves the way for Congress and our region to move from study to action on a permanent solution that will protect the environment, jobs and way of life for millions of people,” said Brammeier. Scientists agree that the entry of the bighead and silver carp into the Great Lakes from the Mississippi River system, where they now live, could upend the lakes’ ecology and the region’s $7 billion fishing industry, the groups point out. The Chicago Waterways System, which feeds into Lake Michigan, has been identified as the most likely route for the carp to enter the Great Lakes. The report comes shortly after the Army Corps admitted in another report that a series of electrical barriers designed to repel the advancing Asian carp can be breached, leaving Lake Michigan and the other Great Lakes vulnerable to the destructive non-native fish. The Army Corps findings parallel public support for physically separating the two systems. The public has asked for a long-term solution to the Asian carp crisis since environmental DNA of the big silver fish was discovered inside the electric fence in 2009. The Army Corps study pegs the cost of separating the Great Lakes and Mississippi River systems in the billions, a cost that is in-line with large-scale city infrastructure projects in cities across the region. To view the report, summary book, and details on the public meetings, register to speak, or to make an online comment, visit the GLMRIS Report page. Comments will be accepted until 30 days after the last public meeting, or March 3, 2014. SPOKANE, Washington, January 7, 2014 (ENS) – A federal court in Washington State has allowed a Clean Water Act lawsuit to proceed against BNSF Railway Company for coal contamination of U.S. waterways. The Sierra Club, Puget Soundkeeper, Columbia Riverkeeper, Spokane Riverkeeper, RE Sources for Sustainable Communities, Natural Resources Defense Council, and Friends of the Columbia Gorge, filed the lawsuit on July 24, 2013 in the U.S. District Court for the Eastern District of Washington, after finding substantial amounts of coal in and along several Washington waterways near BNSF rail lines. A similar case is pending before the Western District of Washington in Seattle. BNSF is the second largest coal shipper in the nation, shipping coal through 28 states. The company currently sends four uncovered coal trains through Washington state every day, each with an average of 120 rail cars. Based on the company’s figures, BNSF’s trains lose an estimated 240,000 pounds of coal dust along its route daily. The conservation groups point to BNSF’s long history of violating the Clean Water Act, which plainly states that dumping of any kind into a U.S. waterway without what is known as a National Pollutant Discharge Elimination System (NPDES) permit, is a violation of federal law. Each violation of the Clean Water Act carries a fine of $37,500, and the plaintiffs assert that every rail car that loses coal is considered a unique violation – a large number when four trains a day, each with 120 cars, travel through Washington. The implications of the case are monumental, as the Northwest has become ground zero in the fight to stop three proposed coal export terminals in Washington and Oregon. If built, Washington communities like Spokane would see an increase of 42 additional uncovered coal trains per day. Residents already experiencing the dust from four uncovered daily coal trains say that they hope that this lawsuit will teach BNSF a lesson in corporate responsibility. “BNSF’s plans to increase its daily coal train traffic by more than 10 times the current amount is a testament to how important it is that they swiftly and responsibly find a solution to their coal pollution problems before further damaging our precious waterways, like the Spokane River,” said Bart Mihailovich, director of Spokane Riverkeeper. WASHINGTON, DC, January 7, 2014 (ENS) – The EPA Inspector General has found EPA Region 6 was justified in legally intervening to protect the drinking water of Parker County, Texas residents from the impacts of fracking. Region 6 concluded that a gas well owned and operated by Range Resources in Parker County either caused or contributed to contamination found in the groundwater. On December 7, 2010, Region 6 issued an emergency order instructing Range Resources to investigate the groundwater and soil in the contaminated area to determine the cause of the contamination and to take actions to remediate and prevent further contamination. At the request of U.S. Senator James Inhofe, an Oklahoma Republican, the EPA Inspector General investigated to determine if Region 6’s intervention against Range Resources, an independent natural gas producer, was due to political influence by the Obama administration. EPA invoked its power to protect drinking water in 2010, prompting Inhofe to request the Inspector General’s investigation in 2011. EPA withdrew its legal complaint against Range Resources in 2012 despite having a report from an independent scientist showing that a gas well drilled by Range likely polluted nearby water supplies. EPA’s withdrawal from Parker County appears to be part of a larger pattern, in which the Obama administration has blocked or abandoned investigations of whether drilling or hydraulic fracturing polluted drinking water. In addition to the case in Parker County, news reports indicate that the Obama administration caused the EPA to abandon studies of potential drilling or fracking pollution in Pavillion, Wyoming and Dimock, Pennsylvania despite evidence of fracking-related harm. Just before the release of the Inspector General’s report, the Texas Railroad Commission, which regulates oil and gas, not railroads, opened an investigation into the case. EPA intervened in 2010 to protect area drinking water only after the commission refused to do so. The commission’s new investigation prevents the EPA from legally intervening now as it did in 2010.